We use open-air photobooths. The cool thing about open-air photobooths is that they allow more of your guests to get in on the fun. Trying to set the record for most people in a picture? 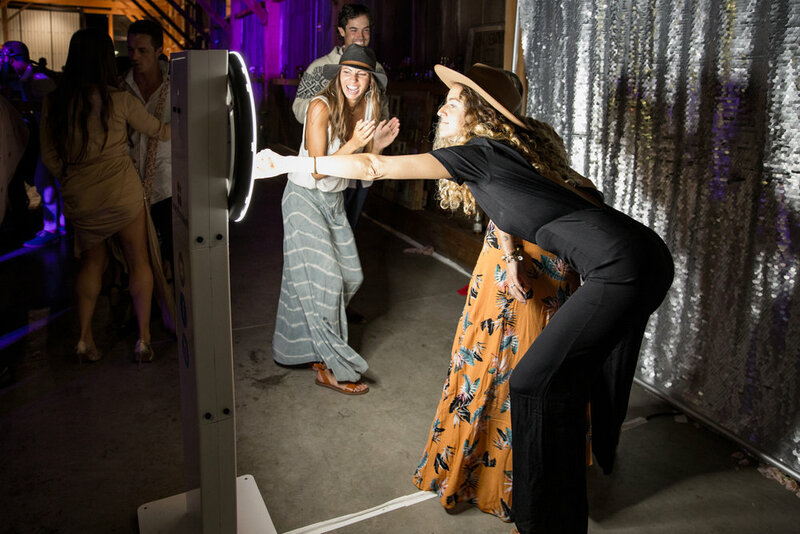 You can do that with our open-air photobooths. And by the way, the record is 22 people! And, for those party-goers NOT in the photobooth, they get to enjoy the fun since it’s all out in the open. We’re fans of putting prints in everyone’s hand, so we do “prints-per-person” for you. That means that everyone in the picture gets a print. Whether it’s two people, or 22 people. They ALL get a print! You’ll have visibility to our inventory during the booking process. You get to choose from our most popular backdrops: white floral, wooden planks with string lights, rosettes in three different colors, damask in two different colors, coral wash, sky blue, and classic white. Yeah, it’s a lot of choices. But we’ll hold your hand throughout the entire process. You’ll find your perfect artwork in our huge library of templates . Find the one you like, then customize it by telling us the color scheme and wording that you want. You can choose photostrips with either three or four photos, as well as any text that you want to include. During your event, guests take home a print from all of their photobooth sessions. After your event, we’ll send you a link to all of the images. You can share the link with anyone that you want to enjoy the pictures. We’ll bring a curated collection of wedding-themed props. You’re welcome to add any props, too. We’ll make sure you get them back at the end of the event. You get “prints-per-person”, which means that everyone in the picture walks away with their own print. All. Night. Long. And we love large groups who set records for the most people in a photobooth picture…so we’re happy to give them all their own print after each session. All. Night. Long. 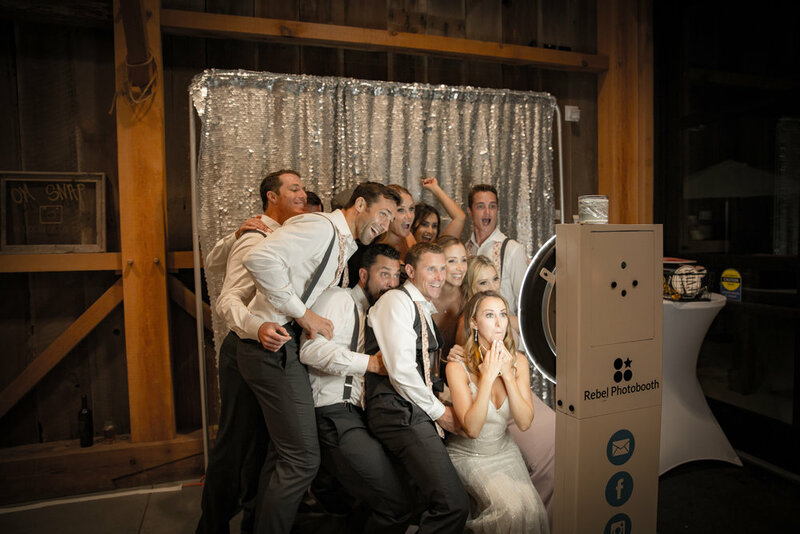 One of our attendants will be with you and your guests during the entire event, guiding them through the entire photobooth experience, from posing, to texting and emailing the images, to sharing on social media, to printing. And if you need an extra person to break that record for most people in a picture…just drag the attendant in with you! We’ll be with you for four hours. Use those four hours as you see fit. We can keep the photobooth open the entire time if you want. Although, we highly recommend all butts in seats for speeches and your first dance! We’d be happy to help guide your guests back to their seats, and close the photobooth for an hour or so, to help with this. heather with roaring camp WILL PUT YOU IN CONTACT WITH CLAYTON’S TEAM AT REBEL PHOTOBOOTH REGARDING THE BOOKING PROCESS. DURING THE BOOKING PROCESS, CLAYTON WILL GIVE YOU MORE INFORMATION ABOUT THESE CUSTOMIZATIONS. We’ll bring one of our large sequin backdrops, made by Hollywood set designers in Los Angeles. You can choose from two colors: honey or silver. Or, if you want a totally customized, one-of-a-kind backrop, let’s do a green screen backdrop. Green screen backdrops allow us to use any high-resolution image as a backdrop. For example, if you and your partner are world travelers, we could use pictures from your travels as backdrops for your photobooth. The sky really is the limit with green screen backdrops! Trust us…you NEED boomerangs and GIFs! Guests love making them. Guests love sharing them. Guests love watching them long after your wedding is over. Step up from the traditional photostrips to either a postcard size print with multiple images or a super-modern square format print. Only choose this option if you really want to set your photobooth experience apart from every other one that your guests have seen! Gone are the days of guests whipping out their cell phones to take pictures of their photos just so they can post them on social media! 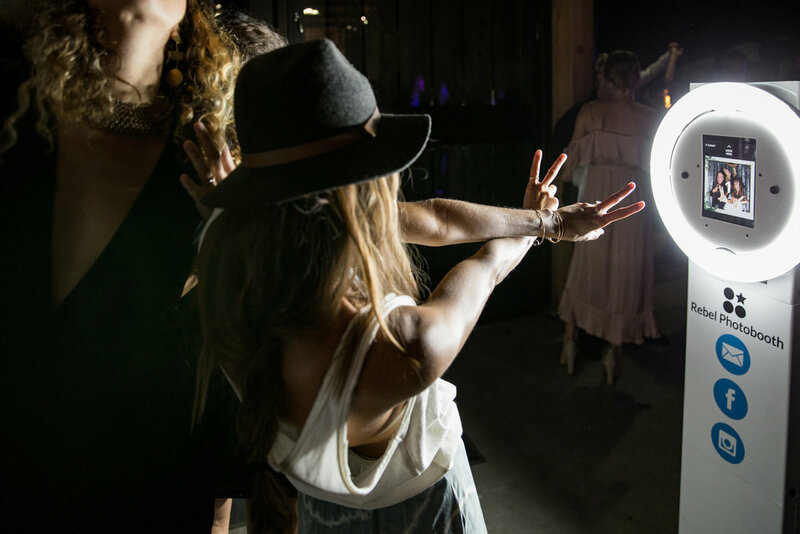 This option allows your guests to immediately text and email their photobooth pictures, and then share them on social media. We’ll also embed any hashtags that you’re using into the email and texts they receive. So that your wedding is sure to receive the social media exposure it deserves! One thing we’ve learned in all our years of photoboothing is this: your guests want to see all the other pictures taken during your wedding. Here’s an easier way to make that happen for you. Because, let’s face it…we know you’re going to be busy enough after your wedding ;) So, we’ll upload all of your images to a private, password-protected web page that shows all of the pictures taken at your event. Your guests can also download, print, and share them from this webpage. Take your prop game to the next level by adding digital props or custom sign props. We’re passionate about putting prints in people’s hands. That’s why we do “prints-per-person” for every event. But we quickly realized that our couples often wanted their own copy of all of the prints, as well. So we now offer an option called “Extra take home print”. Which is a horrible name, but we couldn’t think of anything better. But basically, what we do is we collect an extra print from every photobooth session during your event. And we mail them to you after your event.